FILE - A Ukrainian soldier stands during training in a landfill at Chuguev, Ukraine, June 4, 2014. The United States and Ukraine agreed Thursday to cooperate on defense technology and improve Ukraine's forces in a move aimed at boosting Ukrainian defense and enhancing U.S. assistance, the Pentagon said. U.S. Defense Secretary Ash Carter also named a senior U.S. adviser to oversee the effort. 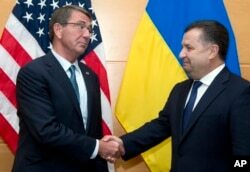 Carter and Ukrainian Defense Minister Stepan Poltorak signed the partnership agreement at a meeting in London in which they also discussed the conflict in eastern Ukraine, where Ukrainian government forces confront Russian-backed separatists. The partnership aims "to enhance the defense capacity of Ukraine's forces, advance critical Ukrainian defense reforms, improve resource management processes and boost defense technology cooperation," the Pentagon said in a statement following the meeting. FILE - Ukraine's Defense Minister Stepan Poltorak, right, is greeted by U.S. Secretary of Defense Ash Carter prior to a meeting at NATO headquarters in Brussels, June 15, 2016. Carter, speaking to reporters, called it a "very, very important agreement" to help further Ukraine's capabilities for defending its territory. He did not suggest it would change the nature of U.S. assistance, which has been focused on defensive support. Carter also named retired U.S. Army General John Abizaid, former head of U.S. Central Command, as a senior defense adviser to Ukraine to help Poltorak and other Ukrainian officials implement the reforms. Russia-backed fighters took up arms against Ukrainian government forces in eastern Ukraine in April 2014 after Russia annexed Crimea in response to the downfall of a Moscow-backed president. Also on Thursday, Germany's foreign minister called for more urgent work to fully implement a cease-fire and voiced dissatisfaction at the slow pace of efforts to resolve the conflict in which more than 9,500 people have been killed. Efforts also are underway to arrange four-way talks between Germany, France, Ukraine and Russia on the conflict.